Here’s a philosophical question for you: what’s a legend, really, but a yarn of fantasy spun from the fact of compounding coincidences? Some legends are grounded in history, with a grain of truth to be found at their roots. Over the centuries, though, someone here exaggerated events to heighten the drama, another there embroidered the tale to make a point, and still others elsewhere gilded the lily just for the sheer joy of making stuff up. Eventually the story takes on an alternate reality of its own, the historical facts embellished with random splashes of fiction. Yet we still love our legends. Add a pinch of wishful thinking, a dash of sentimentality, stir for nostalgic effect; voila, there you have a drink that makes us more misty-eyed with every sip. Then, when we look back, our view of the past gets a little hazy. Our befogged minds start to think that everything was better back in the day. A few things may have indeed been more agreeable. Perhaps life was a little less hectic and time passed at a more leisurely pace. And very few things may even have been a little better, but certainly nowhere near everything. The best cautionary tale that comes to mind is that of elderly musical instruments, especially guitars and amplifiers, which are held in absurdly high regard. Old guitars and amps may look, feel, sound and even smell amazing… But do they genuinely perform better than their modern-day counterparts, or is it all just a trick of the mind? Sorry folks; however it may pain purists, our cherished myths don’t stand up under scrutiny. Stradivarius or strapped for cash? I offer you this in the way of acoustical evidence: Pierre and Marie Curie University in Paris conducted two studies, one in a hotel room during a violin competition and another four years later in a playoff under more controlled conditions where blindfolded professional musicians – we’re talking top-notch soloists here – were asked to play and rate a dozen violins according to playability, tonal quality and the like. The first test’s instruments ranged from an affordable student model to an obscenely expensive Stradivarius. Well, only 8 of 21 subjects preferred an old violin. Surprise, surprise. Somewhat more astonishingly, most chose a new, relatively inexpensive entry-level model. In the second test, the maestros preferred recently made instruments to the vintage models on the order of six to one. Only three opted for historic gems. Granted, violins are not guitars, but the point is still the same. So what are the implications of this for those of us who love vintage guitars? Well, there’s the psychology of perception to consider. If you ask people to judge the quality of a wine, they’ll rate it higher when they’ve been told it’s pricier. If we know that a musical instrument has a unique history, that it’s very old or expensive, we like to believe there’s something special about its tone, an ineffable essence that we’re sure we can detect in there somewhere. At least that’s what our minds are telling us. We fall into the trap of our own making. Old guitars and amplifiers are not good per se. Some are outstanding, but on balance, many more to be had on the open market are stacked towards the dreadful end of the scale. Their often roughshod quality had a lot to do with yesteryear’s production methods. The first mass-manufactured electric guitars were the result of a conceptual experiment driven by the need to ramp up production to unprecedented quantities. A simple, efficient design had to be developed to this end, and the choice of materials was primarily dictated by availability. Today’s certified standards were a long way off yet. If this wood was to be had cheap from that source and some supplier was offering copper wire for pickups at a bargain price, then a run of such ‘special’ guitars was made. When variables as important as this change at random, you’re likely to end up with a few hits and many misses. The law of randomness ruled the business of early electric guitars. But the law of supply and demand has made yesterday’s lemon today’s legend. 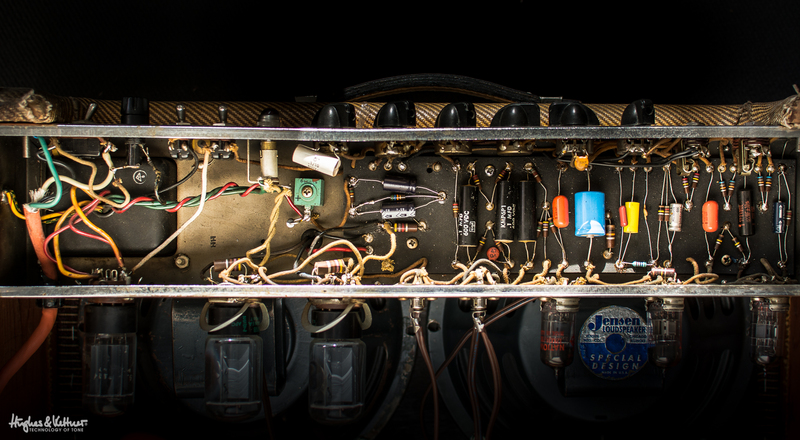 The inner workings of a vintage amp. Hard to see where the magic comes from when you reduce it all to its constituent parts! When guitars went electric, most musicians were happy that you could buy anything at all, and were ecstatic if it was affordable. Even in the golden era of electric guitars in the ’50s, most of these instruments were exactly what most are today: an industrially manufactured commodity. Now, I’m not immune to the seductive charms of a time-tested guitar. The patina of a much loved and often played axe; the living history oozing from its pores; old wood resonating in mysterious molecular harmony – all that’s sweet melody to my ears when I get my hands on a vintage specimen. But when that first storm of enthusiasm subsides, it’s often a sobering experience. The playability and tone, dry or amped, may be fine, but is it really that much finer? Does its response make me feel good because it’s a great instrument or because I drank the Kool-Aid and believe it has to be a great instrument because it’s vintage? And, most importantly, does the difference justify handing over thousands of hard-earned bucks when I can drop by my favorite shop and buy a great-sounding, wonderfully playable new axe, produced to today’s far more exacting standards, at a fraction of the price? A more modern amp’s guts. 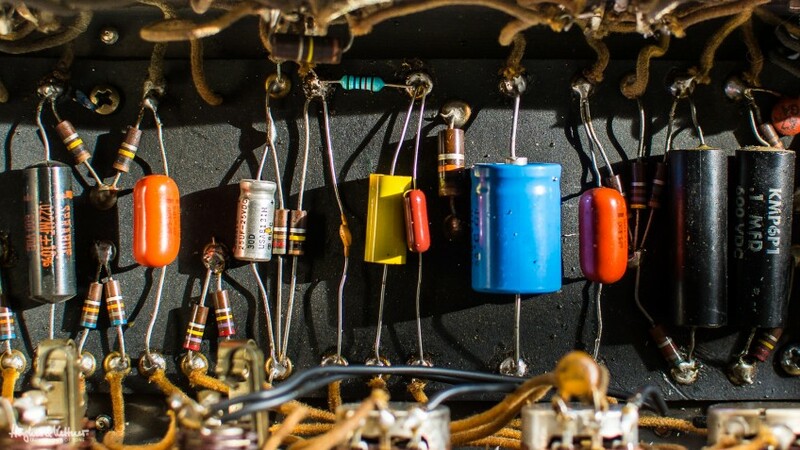 The move to circuit boards might upset some purists, but it’s certainly much easier to build a consistent sounding batch of amps with more modern production methods. After all, many of us would love to tool around town in an early ’50s Porsche 356, but none of us would claim that it accelerates and handles anything like a latter-day 911. Unless we’re crazy, of course. Because although the oldie sounds sweet, smells good and looks great, the new model is by any standard a better engineered, safer and faster ride! It’s the same story with amps. Much has been written about the pros and cons of hand-wired, point-to-point-circuits, but the fact is that random chance contributed a great deal to the mythmaking. Yes, those (in)famous harnesses were hand-wired, but a harness sloppily patched together on a Monday by hung-over Jack was not identical to the harness meticulously crafted by exacting Jill on Thursday, and an amp wired on Wednesday might be another animal entirely. Geography matters a lot more than many would care to admit. The position of conducting components in the amp certainly affects tone. A few millimeters difference in the wires’ pathways can determine if an amplifier sounds great, good, or merely mediocre. And on top of those tolerances attributable to relatively crude assembly methods, vibrations and temperature-induced changes tend to add up so that an amp’s tone can change markedly over time. This explains why two identical amps can sound so different. I speak from experience because in my younger days players would do just about anything to get their hands on as many guitars or amplifiers of the same type for comparison so they could be sure of finding that elusive good one. Each sounded different and it took a bit of luck to get exactly what the manufacturer promised. The select few that rose above the dross stood out like skyscrapers amid a cloud of mediocrity. These rare instruments are the stuff of legend, the rest its curse. Some might say that there’s just one amp-based path to tonal heaven: a point-to-point layout with hand-wired harnesses. I beg to differ, because this antiquated technology is, even under the most favorable conditions, very susceptible to variations. And in manufacturing, quality is inversely proportional to variation. As it increases, product quality decreases. That kind of variation just doesn’t trouble a well-designed and made circuit board. Some 21st century engineers aren’t guided by the dictates of logic and math alone when mapping out circuitry. They fiddle and fuss with layouts, moving this here and that there throughout the development effort to find the arrangement that delivers the best tone. Why? Because today’s guitarist expects an amp to put the best tone, from vintage to modern, at his or her fingertips every time and everywhere. And the amp maker is expected to deliver the goods at an affordable price. That’s a gauntlet we at H&K gladly take up, even if our way of doing things doesn’t lend itself to mythmaking. But then again, the Technology of Tone is no mere legend. Plug into a Hughes & Kettner amp, strum three chords and see if you don’t agree that it’s the truth. First published: April 10 2015. Most recent update: April 10 2015. A very honest and objective article about a very charged subject like guitar amplifiers, I agree that no matter where, how or who is involved in making amplifiers for very different ears, cause its all so very subjective, to the credit of H and K they have been making at least reliable equipment, my 25th HK anni produces what i like to hear from an amp, but its not perfect it ways a ton, so it stays a home, i ve got a small hand wired 5f1 circuit which i love because it has 1 knob, (simply genius, more time spent on playing rather than knob twidling and or pushing will have way more impact on the sound than x y or z amplifier thats just my two cents worth, roll on keep on rolling! Cheers, and keep on rolling! I’ve worked up and down the amp ‘Food Chain’ over msny years, starting out with cheap solid state amps, adding distortion boxes, graduating to small cool tube combo amps, and finally onto a full-on 100 Watt Marshall Super Lead stack. The Marshall was fantastic, but became too loud for the venues I performed in (no master volume on that amp), so I went on the search for the best ‘Amp in a Box’ offered at that time. I tried to convince myself it was ok, well sorta…. Took a long break from playing, and now own an Eleven Rack, several small vintage amps, another Marshall Plexi ( for bragging rights only ) and a bunch of real good studio-level effects processors to buffer the ‘synthetic’ quality of the Eleven Rack modeling. Vintage Tube amps are the king of fundamental non processed tone for the most part, dollar for dollar, even including servicing cost to get the amp in shape. It took me a long time to realize this. The best virgin unprocessed guitar sounds I’ve ever gotten are from my vintage amps – (clean, crunch, and sky high boosted). I think the ‘Mistakes’ that were made in early designs lead to finding some incredibly good and complex tones as well. Valco amps for one, changed their amp designs like they were changing socks, and many of those vintage amps are absolute gems, along with old Fenders and Gibsons, just to name a few. My vintage amps ‘Howl’, Scream, and get mellow in a natural way I have never been able to achieve with any modern amps. Dynamic touch sensitivity is important to how a skilled guitarist plays, not just the frequency response – (Tone), and touch dynamics is were many vintage amps shine. You have to play one to know. I’ve played several of the newer combos and reissues, and I have a feeling they are more driven by marketing schemes than a quest for great sound. The flexibility of a newer tube amp with a good master volume and Effects Loop – (lacking on most vintage amps) is indeed attractive, particularly if you can only afford a single amp, and if you need to be flexible with your volume and tone variations in your live sound. If you can afford more, by all means purchase a variety of amps, including the super great vintage ones, and you will sound all the better. But in the end, if you think it sounds good, then it is good ! Thank you for the interesting comments Harold (and yes, they certainly made the cut, we’ve just been on the road for a few weeks and couldn’t get round to doing blog stuff in that time! Sorry about that)! It’s fascinating to hear this from someone who clearly has a great deal of experience with all different kinds of amps, and from many different eras. And we do agree with your sentiments in many ways, actually. There’s nothing like plugging into a simple old tube amp that’s pleasantly cranked, and letting rip. Funnily enough, this also seems to sound best when we use a vintage guitar too, which is why we sometimes think it must be at least a little bit psychological! The way you’re doing things now – owning a range of gear of different types, and each of which work best in certain conditions – would be the way we’d recommend all guitarists go, assuming they can afford it. Digital gear is king for versatility, and recorded in a mix, it’s really convincing. And for a gigging musician who wants a workhorse tube amp they can trust to rely on night after night (and not be too bothered about losing, spilling beer on, or breaking!) we’d always go with a modern-day tube amp, like the GrandMeister Deluxe 40, which can do pretty much anything and takes pedals really well too. Then for home playing, and pure, unbridled enjoyment, it’d be a vintage Plexi, or a Bassman, or something of that ilk. Ultimately, it’s just like you say – tone is subjective. What we think sounds great might not be what you, or the crowd, will think sounds great. So play as many amps as you can, and when you find the one that sings to you, grab it and don’t let go! There were significant advantages to older methods that tended to disappear during the 70’s. First, the any AC on the wires creates a magnetic field proportionate to the voltage which can be inducted into other wires in close proximity. Minimizing contact area has always helped tremendously with this issue, however the older amps also used wire lead which is far more effective in eliminating inductance. No commercial amp companies currently use wire lead to my knowledge. Although there is nothing inheirently wrong wrong with PCBs, isolating induction is far more difficult than it is with point-to-point wiring using thoughtful leaded wiring routing. Second, commonly available parts in the past are not currently available over the last several decades. The polypropylene coupling capacitors are tonally different than other commonly available capacitors today, although mylar is generally in the neighborhood tonally. Transformers were not really designed with “Hi-Fidelity” in mind until the 70’s. I am a firm believer that guitar is a very Lo-Fi signal and a large portion of the sound in vintage amps is due to the compression and unbalance from the output transformers. I am not aware of a current transformer manufacturer that doesn’t “overbuild” their transformers today as a quality in comparison. I believe the grossly underrated transformers used in the famed “plexi” Marshalls were the largest source of their “magical” sound (as well as the reason they melted down so easily). If “Hi-Fi” was really any better for guitar the UL Fender amps would be highly sought after instead of avoided by everyone. When I do a custom build I always attempt to find a pre-70’s amp for the transformers for this very reason. Although sound is the end result, my experience leads my to the conclusion that the “feel” and reaction of an amp to what the guitarist is playing is possibly more important than the resulting sound. It is a rather difficult to explain it unless you have grown used to it, but it seems that the less circuitry processing the signal leads to a far more responsive amp. Dr Z and many in the boutique amp business have built careers simply by minimizing circuitry and attenuation. 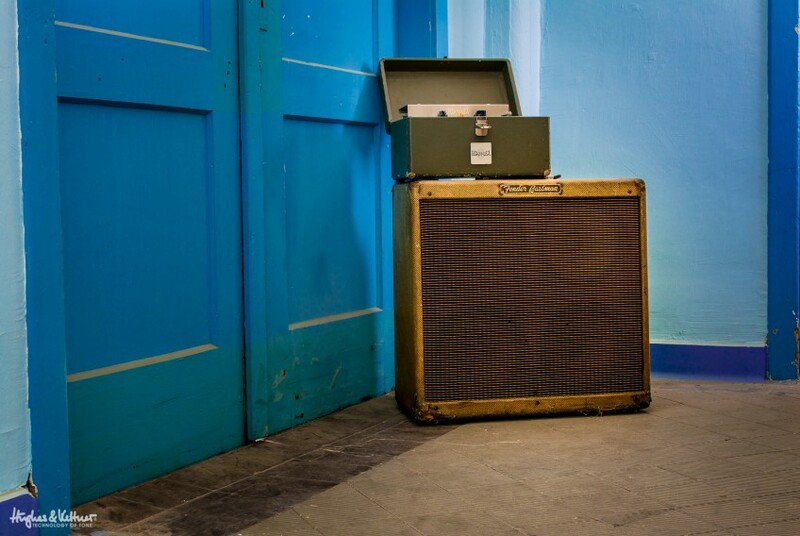 The fabled vintage amps were among the simplest ever built commercially. Tube rectifiers also add to the reaction that isn’t commonly used in modern production amps. I don’t find modern amps bad by any means, but I can easily see where many talented guitarists tend to gravitate to the vintage amps which aren’t easily reproduced exactly today. Well, I can speak accurately about this subject since I have been playing guitar professionally on international tours and as a session player for 25 years and used old and new amps without prejudice. In the end, I am looking for what will reliably give me both the sound I am looking for as well as inspire me while playing guitar. This article I must say comes off jaded, one-sided and inaccurate with a spin towards putting down vintage equipment in order to sell your new equipment. I toured most of Europe using a H&K stack and it worked fine. It was not “better” than vintage. It was not more reliable than vintage. Though I like H&K, I must be honest and say the sound doesn’t inspire me with the same sound as vintage. Sorry. I put my money where my mouth is… I have invested in mostly vintage amps as a result of what I say above. My experience is the exact opposite of your article. While you seem to downplay vintage amps, I feel it only fair to provide your bolg readers with a real world experienced point of view that is not biased by the desire to sell modern amps. New doesn’t sound or work better than vintage unless the amp is not serviced. It is not hard or expensive to maintain vintage amps for the most part either so I want to put that out there. If I had to spend a bunch of dough to service my vintage gear, I wouldn’t bother with them. Are there quirks sometimes? Sure. But most would take them over an amp that will never have 50% the sweet, juicy character of vintage. Every time you read an article about a piece of good/popular vintage gear that states something along the lines of “plugging in and cranking up yields a breathtaking experience”, that is reality. There is a reason you read this all the time most everywhere, but you only read here that vintage amps are inferior to modern. Hi Drock. The cool thing about doing this blog is that we’ve got so much great input from players of all styles, experience levels and opinions. And we take your points, for sure – there are indeed times when vintage gear seems to just have an aura about it. Mojo, if you will. Mostly for us it’s with guitars rather than amps – just that feeling you get when you open an old case and there’s a gem in there. Even the smell is incredible! And you’re right, of course – some vintage gear is reliable. And some new gear isn’t 😉 It’s never that black and white in reality. What we were trying to get at is that in some cases, newer gear might be more suited to jobs than something that’s 40 years old, for whatever reason. But the great thing is: guitar tone is in the ear of the beholder. As long as we like what we hear, that’s all that counts – regardless of what something was played through, or with. While I do think that PCBs do lend a bit of consistency on their own, as I said before, quality of parts is another important part of producing a great amplifier. I must say, as a general rule, that if it moves, a part should NOT be on a PCB. That goes for input and output jacks, as well as control potentiometers. Every time one of these is moved, though connection cycles or adjustments, it stresses the solder points and makes them weaker. So, my answer is both, but put the stuff you don’t want to move on the PCB and stuff that does off of it, attached to the PCB via wires. Wouldn’t you agree that it would be the best of both worlds? I restore old tube hifi and guitar amps for a living, so I think I have a pretty good perspective on vintage sound. Recently had a customer bring me an early Princeton that he said was pretty good, but he wanted me to check it out for him. The filter caps were all very leaky, several coupling caps like-wise with way off value, and the cathode cap and resistor on the output tube were way off value and the cap leaky. New high quality filter caps, coupling caps and the correct cathode resistor (determined by measuring plate current) and the amp was running and meeting specs. He picked it up and called me later in the evening to tell me it had never sounded this good. (Even when he bought it new) He went on for 20 minutes about the punch, crunch and break up. He said he never mentioned to his buddies that I had worked on the amp, he just plugged it in and played. They wanted to know what he had done? Virtually any amp that has not had filter caps replaced in the last 10 years isn’t sounding like it did new. Many performers who rely on tube amps have the filters changed EVERY YEAR. Had another customer who had an original Fender Bassman. I went through it and he was thrilled. He bought a newer one and couldn’t believe how bad the newer one was. Went through it and it improved dramatically, but still wasn’t the same as the old one. After a few resistor and cap substitutions we were able to get them pretty darn close, but the older one still sounds better. Is it the tubes, the speaker, the circuit board or what? Can’t tell you for sure, but a vintage amp set up correctly will give you sound that none of the newer, ( especially transistor/IC/mosfet) can come close to. Let me clarify that a little. There are some new amps being built to day that are better than the originals. Kendrick’s are a perfect example. Lots of great small companies making some very good stuff. Tubes sound different that transistors and it is very difficult to make a transistor behave like a tube. Very interesting, Bruce. It’s true that sometimes older gear will give you a ‘better’ sound than a modern equivalent that technically should be wiping the floor with its older brother. Perhaps it’s something to do with how the parts degrade slightly as they get older, or even just the imperfections in some older components – like speakers – that we’ve eradicated over time, but that actually help with things like break-up and punch. Now, if we could just bottle whatever that element is, we’ll be set for life 😉 Thanks for sharing your experiences here, and hope you’re enjoying the blog! As someone who has repaired a great many amps of nearly all types and brands, I can also say, with reasonable certainty, that simply using a circuit board to build your amplifier doesn’t necessarily equal the holy grail of consistency. You still have to deal with “hung-over Jack” vs. “exacting Jill” in the modern world of amplifier production, to an extent. 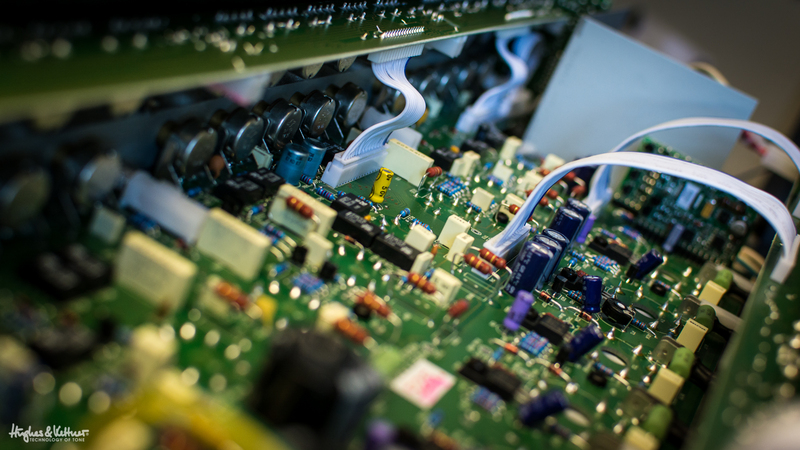 There is also another thing to consider: The quality of some components, particularly capacitors, has been a sore subject among many of us in the repair community. Your company, like many others, were producing amplifiers in the late 1990’s and early 2000’s, during the “capacitor plague”. 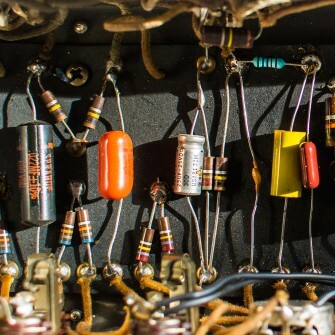 During that time, capacitor failure was rampant and repair professionals like me began searching for the consistent quality that we found in time-tested vintage brands, such as Sprague or Mallory. 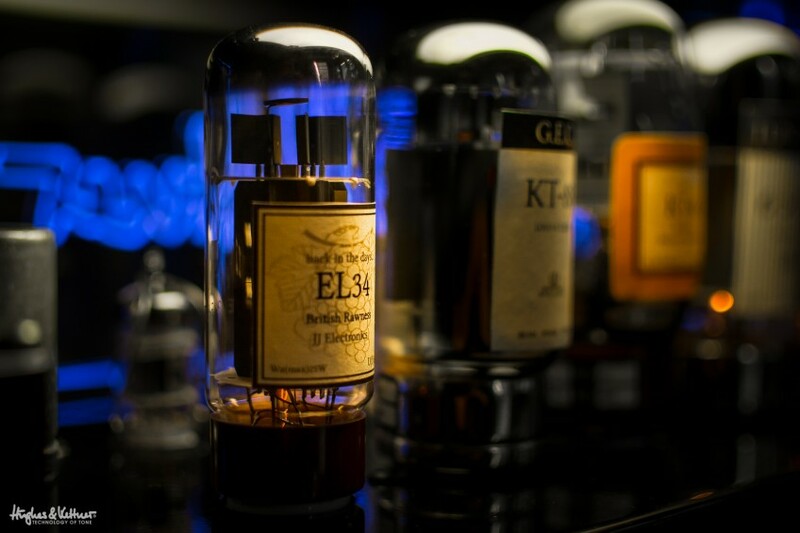 Capacitors are already the most volatile, yet most needed component in almost any electronic design, so it’s enough of a gamble putting “just any old thing” into a tube amp or anything else. The point here is that it’s not just about circuit board vs. point-to point; it’s also about the use of truly quality components and quality in workmanship that produces consistent runs of amplifiers! Thanks for the great input Craig, and you’re totally right: it’s not as black and white as this approach versus this one… As an experienced repair man, which would you recommend, given the choice? Hmm. A vintage ’57 Les Paul or today’s Les Paul Standard. I’d like to do the blind taste test on that one. I have a 2012 Les Paul Standard Premium Plus, and it is worth maybe 80 times less. I love the tone and feel of my guitar, but there has to be a reason why the originals go for over $100 grand and the reissues go for over $6000. Old world craftsmanship vs. Six Sigma quality assurance. The allure of the old against the whiz-bang features and gizmos of the new. Why wouldn’t a company working to push out brand new amps of state of the art design push their offering over the methods of old? I personally like vintage amps. Do I fall in for the whole “mojo” argument that there’s magic in the sacred pathways of cloth wire and mustard caps? No, I don’t. I like vintage amps, specifically Fender and Marshall varieties because of their complete simplicity. Normally two channels tied together in some arrangement with some variety of tone stack pushing some speakers. You want overdrive? Turn the amp up and let it breathe. You want clean? Don’t push it so hard. Simple. But what I really like is the simplicity of the design. Sure, there are no elegant cad-designed two sided PCBs with each trace intricately laid out in an optimal fashion. But then again, when Leo or Jim Marshall put together their products there was a 20% +/- margin of error and sometimes even more. It was enough that immigrant women from southern california and ex-military technicians in England could easily put these things together with care and quality. They were not big technology production and were really built using the cheapest parts available in quantities at the time, but they lasted. Fifty years ago, a woman in the Fender factory wired the heaters on one of my blackface amps and she put in the filter caps for my power section. Fifty years later, I can bring the amp to original life with nothing more than some solder, a decent iron, and $10 worth of parts. And I can do it in less than an hour. Can I say that a brand new H&K purchased today will have the same longevity? I don’t know. I do know that when we’re talking about surface mount components placed by computer pick machines and soldered using lead-free processes with millimeters and sub-5% margins of error, I don’t hold my breath. None of this is to say you aren’t producing a great product. It’s just saying don’t discount old for being old or as a counter to the “mojo” straw man. One of the final thoughts I’ll close with is that if I don’t care for the specific tone of my Plexi, there’s nothing that says I can’t crack it open and throw in some new values at key locations to arrive at a sound I DO like. PCB is awesome for cost reduction and principles of continuous improvement / error reduction – but turrets and eyelets are great for your customers and longevity of the product under harsh conditions. But, as with the guitar world – any technical field, really – we’re all for newer methods and trying to make progress. Whether that means replicating vintage tones but adding in extra reliability (or trying to! ), or just giving players way more options/channels/gizmos than before, it doesn’t matter. Ultimately, guitarists today have a huge range of gear to choose from, and we respect any choices they make. If your tone sounds good, it doesn’t matter how you get it. And, if you read this Blog and it made you think about this stuff, then we can all be happy. And we think this time it worked. Thanks again, and all the best!